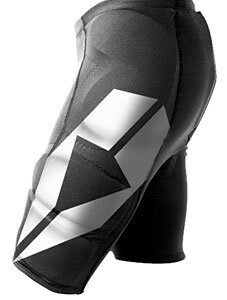 I can see the EVS PP05 Ultimate Shorts as a great protection option in a variety of riding situations. The shorts are constructed of Lycra and Spandex and are intended to be worn under other pants (unless you have a LOT of confidence). The garment includes high-impact padding for the hips, tailbone, and thighs. They also have a synthetic chamois pad in the crotch area much like bicycle shorts -- and for the same reasons. So those are the features -- so who would wear these? First, I see these being attractive to street riders who want to wear jeans but still have thigh, hip, and tail protection. The stretchable material and the chamois crotch would contribute to all-day comfort. I can also see these being used in dual sport, adventure touring, and pure dirt situations. The hips are vulnerable in all these venues, and these versatile shorts will offer added protection in relative comfort. You can find these shorts at a sub-$75 price. You don't get a better value than that in solid protective gear. Their versatility makes them even a better value. The shorts are offered in sizes small to 2XL and are reported to run true to size. Click here to find this undershort on Revzilla.com.